The baseball shot off Jordan Maxson bat directly towards Nevada pitcher Peyton Warren. The ball caromed off the pitchers mound and leapt into centerfield. Alex Phillips and Malik Williams scored, tying the game at two. The loss drops the Mustangs to 14-9 on the season. They trail the first place Sedalia Bombers by three games. The first 500 fans to the ballpark walked home with a Mustangs 10th Anniversary Baseball, courtesy of Herzog. Even at two in the fourth, third baseman Terrence Spurlin found a gap in the Griffons defense with a bloop single into left field. The well-placed hit scored Phillips giving the Mustangs their first lead of the game. St. Joe pitcher Brennon Covington was sensational in his third game on the mound this season. The right-hander threw six innings, striking out six, and giving up just two runs. The stands at Phil Welch were covered in black and gold as fans came out to show their support on Mizzou Night. Nevada rallied in the top of the eight scoring four runs to secure the victory. Following the game fans enjoyed a front-row seat to the Mosaic Life Care Fireworks Spectacular set to the tune of some of the greatest hits from the year 2014. Brennon Covington pitched six innings with two earned runs and six strikeouts. Alex Philips went 2-5 with a double and two runs scored. Zach Perdue went 2-3 with two singles and a run scored. Covington leads the league with 34 strikeouts this season. Phillips hit his league leading eight double of the season. The Mustangs will travel to Nevada on Monday for the final matchup of the two-game series. 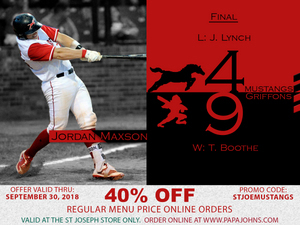 St. Joe will be back at Phil Welch 5:30 p.m. Thursday taking on the Jefferson City Renegades (10-8). The teams will resume their game from June 9, which was suspended due to inclement weather. Come to the ballpark for Incredibles Night featuring a movie ticket giveaway, and free Mustangs superhero capes, to the first 300 fans, courtesy of Citizens Bank. Bring the children for Family Night where kids cheer free and hot dogs are one dollar. The MINK league all-star game will take place at 7 p.m. Wednesday in Joplin. Come out and support the eight Mustangs players that earned the right to participate; Alex Phillips, Joshua Lincoln, Terrence Spurlin, Zachary Smith, Drake Kanallakan, Brennon Covington, Jonathan Lynch and Matt Mulhearn. For all information on Mustang’s baseball visit stjoemustangs.com, follow the team on twitter (@StJoeMustangs), like the team on Facebook (St. Joseph Mustangs), and follow the team on Instagram (St. Joe Mustangs). For a glimpse at the game-day experience follow the Mustangs on Snapchat (stjoemustangs09).